1) In a small bowl, mix together the tuna, green onions, mayonnaise, salt and pepper. 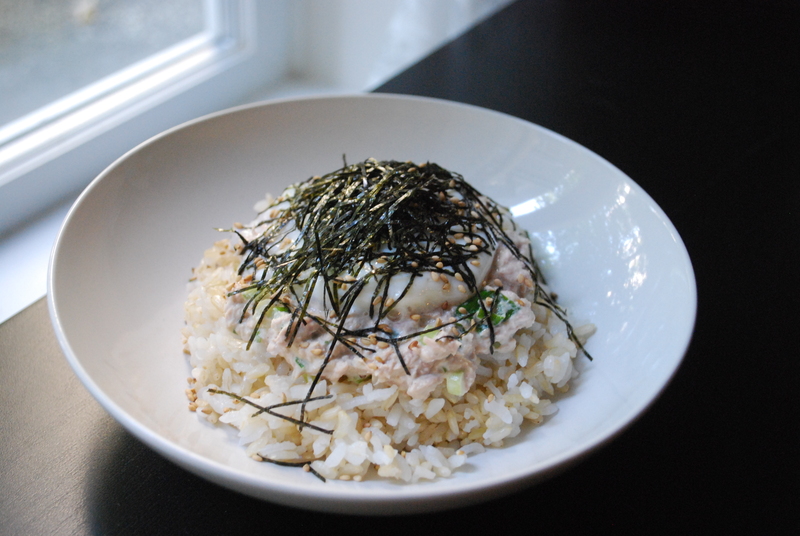 2) Put the rice on top of a plate, then half of the tuna mayo on the rice. 3) In a small cup, crack the egg in, and then pour tap water into the cup. Just pour enough to cover the egg. Microwave it for about 20 seconds, or until it’s cooked on the outside and runny on the inside. You might actually have to test it coz everyone microwave is different. OH and I find that the container makes a difference too! So it’s better to microwave it for shorter time first then slowly add 5 seconds at a time. Anyways… you can try it at home. 4) Put the egg on top of the tuna mayo. 5) Sprinkle as much sesame seeds and seaweed on top as you like. 1) I think this dish took me like… 5 minutes to complete? 2) It’s a cheap dish!!! Miss S told me that one time she got her tuna for $0.49, and that was quite recently. So this meal would cause her about $1.00 and it feeds two people! So cheap. I’ll remember to stock up on the tuna next time it goes on sale. I had never thought that you can make marshmallow from scratch before… until Ms. K actually made it and brought it to work many months ago. Ms. K kept telling me that… it’s not that hard to make. I didn’t believe her. 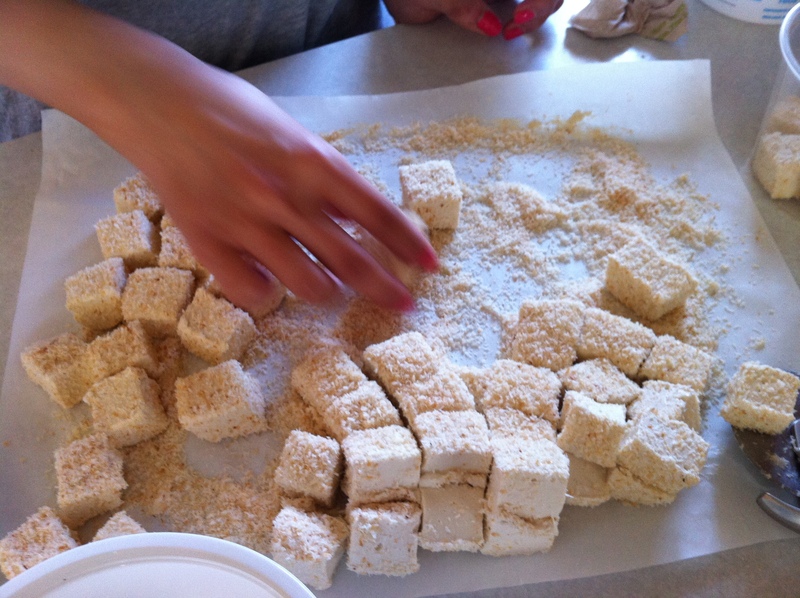 Then today, she decided to make marshmallow with me… so we made it. Hmm… really, it’s not really hard to make. It’s just A LOT of work. 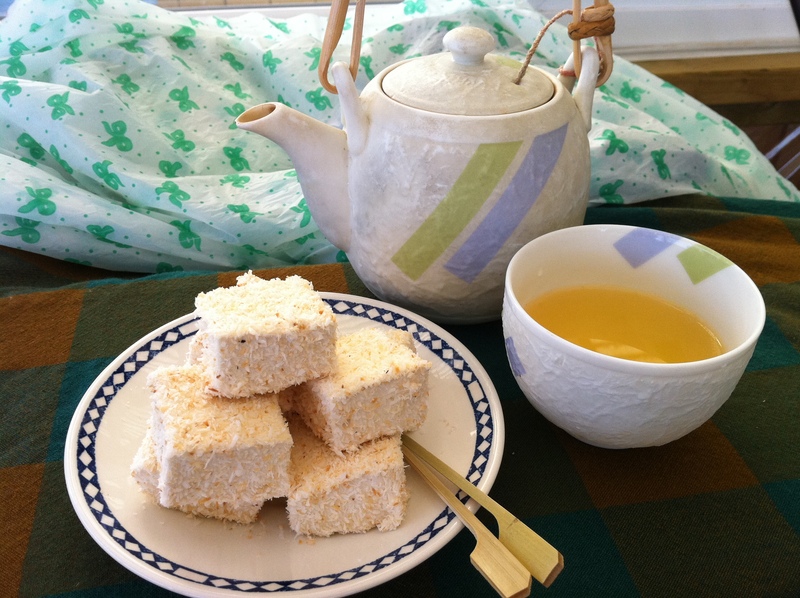 Ms. K follows the recipe here, so please go there for detailed instructions for the marshmallow. 1) Toast shredded coconut in a wok until it turns yellow/brown. We used about half a pack of shredded coconut. 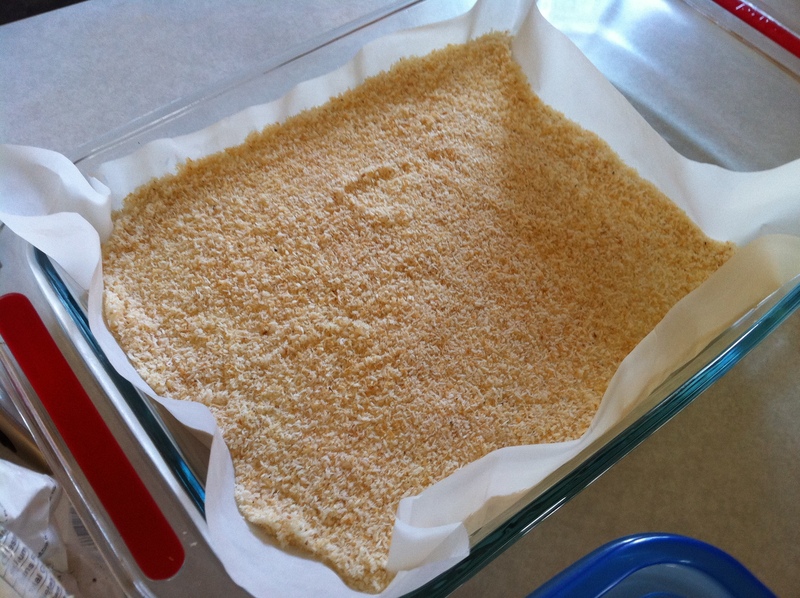 2) Evenly spread the toasted coconut on the parchment paper. You don’t wanna see any gap between the toasted coconut. 3) Pour the marhmallow liquid onto the toasted coconut. 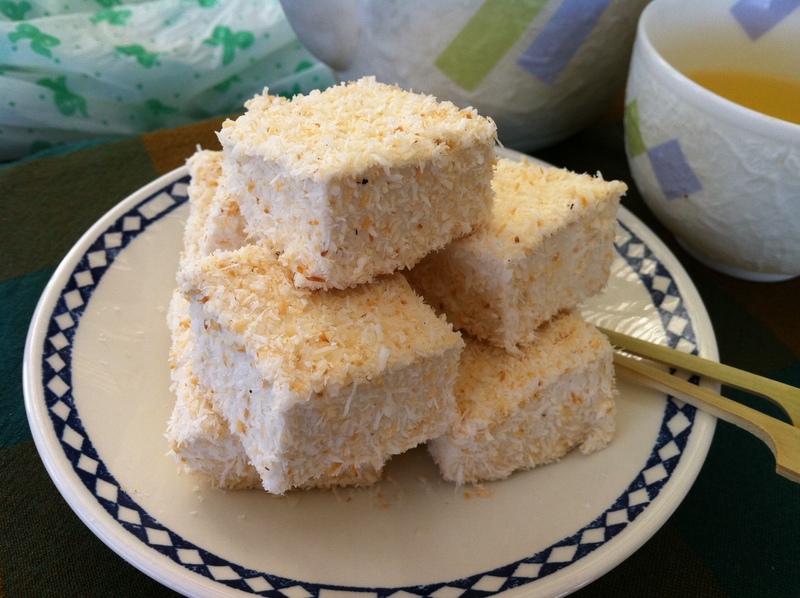 4) Pour the rest of the toasted coconut onto the marshmallow. Spread even. 5) Let it sit until the marshmallow is done. 6) When the marshmallow is done, use a knife to cut the marshmallow into shapes that you like. Pizza knife is HIGHLY RECOMMENDED. I can’t imagine how you can cut the marshmallow with a regular knife, coz it’s SOOOOOO sticky! 7) Coat the marshmallow with the remaining toasted coconut. 1) It was super yummy! hehe! And yeah… it’s not that “hard” to make… it just takes time. 2) Marshmallow is super sticky! So be ready to get messy! 3) Ms. K actually made it with Matcha powder before, and I really liked it. But then match is quite expensive… and if you wanna coat the marhsmallow with matcha powder… hmm… it’s gonna be super expensive. My #1 fan Ms. K will be moving to another city for her practicum for a while. She asked me to design a menu for her (I guess partly as a joke?). I took the challenge (as we were joking?) before I knew what I got myself into. She doesn’t eat chunk of meat, no fish. No plain boiled vegetables. It has to be cheap and nutritious, it has to look pretty and colourful. Oh she won’t have access to Asian supermarket so there will be a lot of things that she can’t use. Hmm…. I mostly cook Asian food!!! What should I do??? Anyway, I’ll try my best, Ms. K! 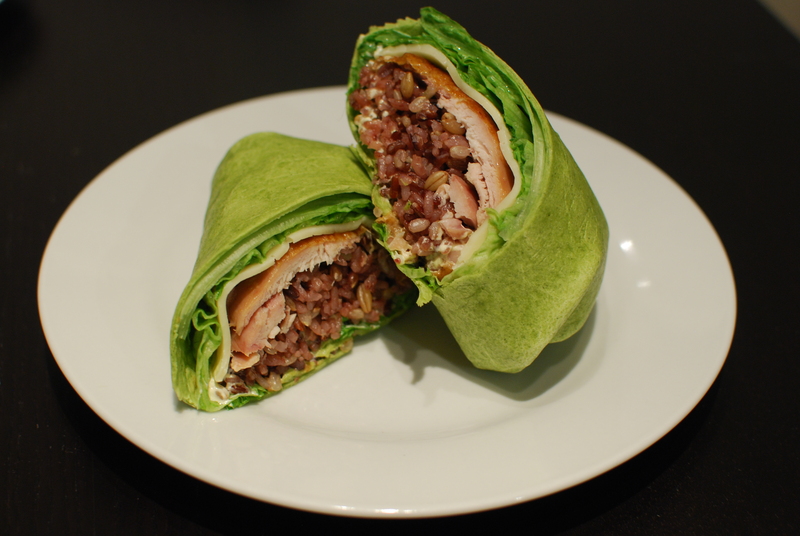 Here you go, Ms. K. Your very first meal: Roasted chicken wrap. 1) Put the lettuce on the tortilla wrap, put the harvarti cheese on the lettuce, put the chicken on the cheese, rice on chicken, mayonnaise, salt and pepper on rice. 2) In case you’re wondering why there’s this new category, “Cheapickdorable,” uh… Ms. K and I came up with this name. The full meaning of it is, “menu for a cheap and picky but VERY ADORABLE student…” she came up with the description, I shortened it. You are currently browsing the archives for the Cheapickdorable category.